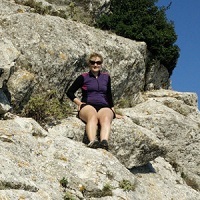 This entry was posted in Hiking Clothing Recommended Products Women’s Hiking Base Layers and tagged asics backpacking tank top built-in bra tank top climbing tank top fabb hiking tank top icebreaker lucy mountaineering tank top Outdoor Research on January 20, 2019 by Laura P.
A tank top with a built-in bra is perfect for hiking or mountaineering, both as a base layer under warmer clothing or when the temperature is high and you don’t feel like wearing much more than one layer. The brave (and impervious to cold) can of course flaunt a normal cropped sports bra, but we recommend keeping your obliques warm in a tank with a built-in sports bra. Hiking, climbing and mountaineering require some support for your chest as they are low to medium-impact activities and this is exactly the level of support a built-in bra in a tank top can provide. Various sports and hiking brands offer the generic racerback tank top with non-adjustable straps, but for this list of the five best tank tops for hiking we have tried to select some more interesting styles, which are special without compromising functionality – you might even find some of them chic enough to wear for everyday use. On the trails, just remember to bring sunscreen and an extra layer in case of weather surprises – such as rain, wind or thunder storms. 1. 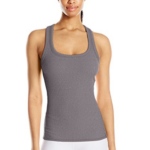 Buying a Tank Top with Built-In Bra – What is important? 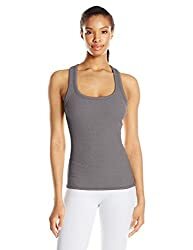 The built-in bras in tank tops for hiking and other sporty activities are usually of the type called a shelf bra or a bra liner, where an extra layer of tight-fitting elastic fabric over the breasts along with a thick elastic under them give you support by compressing your breasts towards the chest wall. The tighter the band, the more support you will get (see Sizing and Support below), but you still have to be able to get in and out of the top! 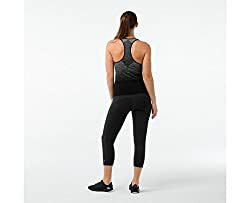 Most workout tank tops with a shelf bra will have straps which draw near the neck rather than running straight up, and then cinch into some kind of racerback shape on the back to ensure absolute freedom of movement. However, this leaves quite some skin bare – which can be a problem on longer summer hikes if you are only wearing a hiking tank top besides your backpack on top. If the backpanel and shoulder straps of your backpack are well-padded, it shouldn’t cause too much discomfort, but if they aren’t they will quickly start to rub against your bare skin and cause irritation. If it becomes a problem, throw on a long-sleeved base layer. For those who mainly hike in the summer time, it will be a breeze to simply wear a tank with a built-in bra along with a waistpack, carrying only the essentials. As a tank top goes on your bare skin, its fabric should feel soft and smooth to touch besides being breathable and moisture-wicking. Tank tops with a built-in bra are usually sized like clothing (S, M, L etc.) rather than bras by cup size and circumference, but that does not necessarily make picking the right size any easier. In our comparison table below, we have entered the sizes of the respective models and the chest circumference (at its fullest) or cup size they correspond to. However, if you want more or less support for your breasts you might want to pick a slightly smaller or larger size than the one which corresponds to the circumference of your chest. If you choose a slightly larger size, you should be all-right for low intensity activities while a smaller size will almost certainly provide you with medium support – or even enough support for high impact work outs (running, aerobics etc.) if you have a small elfin bosom. Women with very large breasts will usually (even if wearing a much smaller size) only get low to medium support out of a tank top with built-in bra, but you also don’t need much more for hiking or mountaineering in a steady tempo. If you are into trail-running or just feel more comfortable with a more supportive sports bra, you should check out our review of the best high-impact sports bras. All the tank tops mentioned in this reviewed can be machine-washed at low temperatures; just steer clear of bleach, softeners etc. and avoid tumble-drying if possible, as it can take a toll on the sophisticated materials used for sports and hiking clothing. 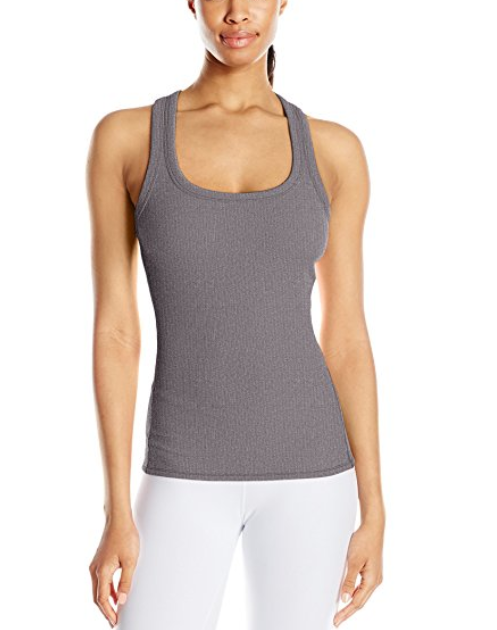 Prana specializes in eco-friendly and comfortable performance clothes for holistic activities such as yoga, trekking and climbing, and thus it is no surprise that the brand offers a wide variety of snug tank tops with a built-in bra. For this list we chose a style with a slightly more covered back – the Prana Liliana top – in case you are carrying a backpack on your outdoor adventures. The Prana Liliana is made of a soft knitted 2-tone rib stretch fabric of recycled polyester with an active stitch construction. It looks like a regular rib tank top from the front, but has a stylish keyhole in the back – just below your ribcage. The built-in bra features a mesh lining, removable modesty cups and brushed elastic to keep you comfortable and supported. The Prana Liliana top comes in three chic colors. We have already mentioned the SmartWool PhD Seamless Bra in our selection of the best medium support bras for hiking and it goes without saying that the tank top version of this sports bra belongs on this list. SmartWool is among the top manufacturers of Merino wool baselayers and the main advantage of the SmartWool PhD Seamless Long Bra is indeed the fabric it is made of. While the shell layer of the tank is made of a durable moisture-wicking synthetic blend, the next-to-skin liner is made of a mix of synthetic fibers and 72% Merino wool fibers, providing natural odor-control, breathability, softness and temperature-regulation. 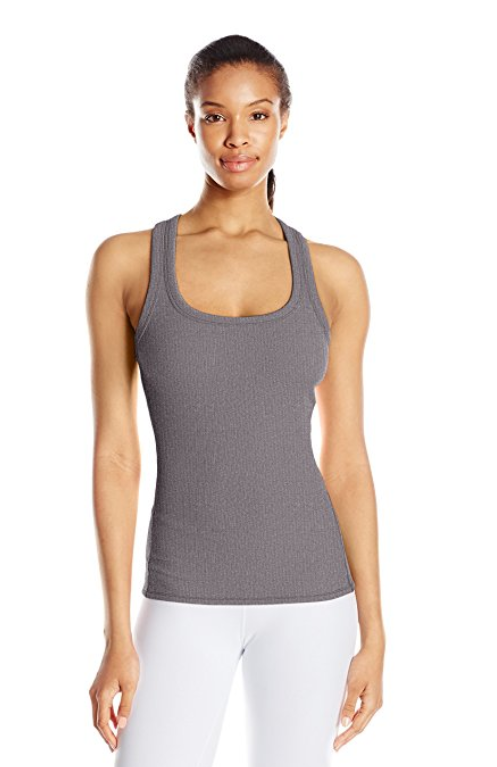 The SmartWool tank offers medium support for A-B cups and low support for C cups. Unlike its cropped sister product, the SmartWool PhD Seamless Long Bra is only available in a grey mélange/black version. The Black Diamond Campus tank top is not for the shy and timid! 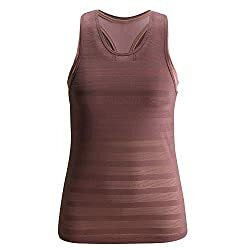 The tank top consist of regular fitting tank in a striped mesh fabric and a tight fitting solid bra in a darker hue (the two pieces can also be worn separately). Although the tank provides quite a lot of coverage in terms of design and cut, the mesh stripes in the fabric are quite sheer, so the inner bra is quite visible. This effect might not be to everyone’s taste but it makes for a different look than regular racer back tops. 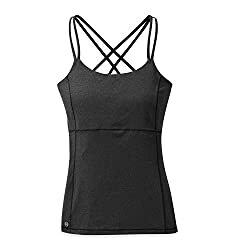 The Black Diamond Campus tank top is made of a light knitted polyester stretch mesh with flat lock seams to reduced possible friction and chafing. While it features a racer back, it has quite wide straps in the front which make it more comfortable to carry a backpack over the tank with nothing in between. The Black Diamond Campus tank top comes in a handful of stylish colors. The Alo Yoga Rib Support Tank looks like your everyday high-street racer-back tank, but there is more than meets the eye. First of all, it has the built-in bra (with removable cups) which will keep you supported throughout low- to medium-impact activities, but it is the soft fabric which really deserves attention. Not only is it breathable, moisture-wicking and offers a 4-way stretch – it is also treated with an antibacterial finish for eliminating odor. 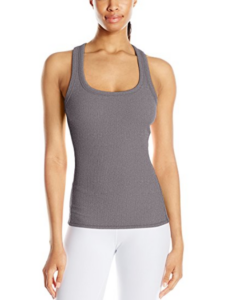 All in all, the Alo Yoga Rib Support Tank is a great piece of performance clothing and comes in several classic colors. The Outdoor Research Nuance is the tank top on this list which shows the most skin in that it has thin double straps which are interweaved with one another into a cross in the back. The fit is trim so you should size up if you are between sizes (see table above) or size down for even more compression. The Outdoor Research tank top is made of a breathable moisture-wicking material which consist of two layers (a shell and liner) with varying amounts of nylon, polyester and elastane to ensure stretch and fit in the all right places. It only goes up to size L (supporting busts around 39 inches in circumference), which makes it the tank top with the most limited sizing on this list. The Outdoor Research Nuance comes in a variety of cool-toned colors.